We’re off at last. There were a few last minute withdrawals which is disappointing, but our 40 starters headed off into the unknown at 3:00 pm. Poor Cath Woodman’s dad died during the night so she had to head for home. An unsuspecting Frank Hussey, who was looking forward to a leisurely few days marshalling, was pressganged into sitting with John Abel. The formalities included the distribution of what seemed to be a considerable number of clothing items. Needless to say the locals – Bolands, Tom Callanan et al – were last to appear. Peter Banham was on hand to give some of the competitors their annual service (the car that is) and Betty was there to keep Peter sustained. Quite a few drivers were attending to matters mechanical/electrical and were to be found in sundry investigative and curative attitudes. All of these endeavours seemed to be fruitful. The three Wards and an Auld had an unplanned rendezvous when a slight deviation from the intended route resulted in their approaching each other from opposite directions. The outcome was retirement for Julian and Chris. Nick and Clifford recovered and finished the day in sixth place. David and Anne Marie Smith tried to confuse the marshals by having 21 on the door and 24 on the boot. David’s excuse was that he had been unable to remove the 24 which had been applied on a previous event. No skulduggery was intended. There was a small outbreak of stymieing towards the end of the Ballinatray regularity when some of the drivers, more sympathetic to the welfare of their steeds, held up some of those with less compassion. With the field being reseeded tomorrow this issue should not arise to any great extent. Leading the field are Irvine Laidlaw and Tony Davies followed by Paul Carter and Richard Porter and Steven Wilson and Trina Harley. See here (IRG Instagram page) for some photos from the first day. There was a bit of a reshuffle overnight when the C-o-C amended an Ideal Time for the last section on the Ballynatray regularity so the starting order didn’t quite reflect the situation accurately. There was some drizzle in the morning but it was warm, so it wasn’t too uncomfortable. At our first time point we had a potentially interesting scenario when the biggest tractor in the world, complete with trailer, went past about two minutes before the first car was due. It would have been an interesting encounter but disappointingly the rig turned into a field. McCarthy’s Bar was the lunch venue. Proprietor Jasper and his team looked after us royally – maybe not quite in the style of the recent wedding, but just as memorably. Jasper seems to have similar tendencies to some of our competitors. He likes to take to the air but is restricted to ‘planes these days after his wife placed an embargo on helicopters after one of his friends brought him down to earth a bit messily after the rotor snapped off. He has flown in and out of Ballyboe a number of times, the home of Paddy and Pat O’Donnell who hosted you this morning. 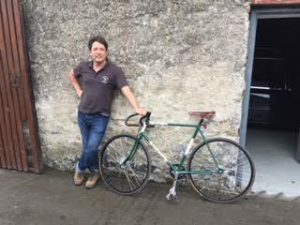 He showed us his grand uncle Gus’s 1904 Hercules bicycle which he had restored recently. It has two gears – one sprocket on each side of the back wheel. To change gear you have to take the wheel off, turn it round and put it back on again. 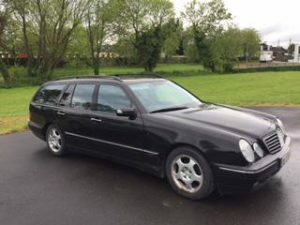 Jasper is also an undertaker and he refers to this understated Merc as a hearsette! He uses it for low key operations when discretion is required. Michael Kunz and Carolyn Ward were forced to retire when his big ends (the car’s that is) gave up the ghost. Also in trouble were Ian Montgomery and Robert Mills. They suspected big end trouble but when they got in touch with Peter Banham he diagnosed pre-ignition and was not impressed when they confessed to not having checked the oil and water before they set off today. On the marshalling front Karen Gaffney was allocated a second man – consecutive, not concurrent, – Johnny Greene had to drive the luggage up to the Lyrath so Julian Ward filled the breach while dad, Chris, drove Frank Hussey’s road car from the Park Hotel to the Lyrath. Having been exhorted to add five minutes to the speed table times to allow for the sightseeing hiatus on the Nire Valley regularity, your scribe forgot to include it in the Ideal Time for that section – another reminder of his increasing fallibility. Rob Jeurissen is enjoying himself despite his wife, Jeanne, losing his dinner ticket – we managed to persuade the Kilkenny Castle authorities last night to let him in. Speaking of Jeanne, her maiden name is Scheefhals, Torti Collis in Latin, and Crooked Neck in English. Styled thus by Napoleon who decided that the Dutch should adopt surnames when he invaded them a long time ago. Jeff Robinson is our furthest flung competitor, having made the trip from Australia. He is loving it. Having the competent Alan Smith as navigator surely helps. James and Andrew Mann found that Josephine (their Lagonda) didn’t like going around corners much today, particularly those in Comeragh House where the co-efficient of friction was particularly challenging. The Battle of the Bolands continues. Unlike the others, who have brought along their wives, all of whom have risen to the challenge, Jim has Neil Sutton guiding him. Despite being a neophyte he is coming quickly to grips with what is required. Andrew and Ann are currently holding sway. The Neals are finding proceedings uneventfully enjoyable. Only a flat tyre on a transport section today upset their equilibrium, albeit marginally. Also suffering a deflation were father/daughter team, Stuart and Emily Anderson. Surprisingly neither puncture was on a competitive section as is usually ordained by Murphy’s Law. Louise Cartledge let her hair down for the dinner which didn’t in any way diminish her allure. David and Anne Marie Smith made a valiant effort to claim another rubber chicken. A three point turn following a navigational error saw David reverse into a gravel heap. The car stalled and refused to restart. A push from a few innocent observers saw him get going with a fusillade of gravel. Not much further along they suffered fuel starvation which turned out to be no petrol in the tank! They were rescued on this occasion by Brian and Sarah King. Brian must have been in the boy scouts with his “Be Prepared” can of petrol. His stewardship of Naas Oil might have something to do with his having lots of fuel on board! On the Nire Valley regularity quite a few were caught out by the attractive slot left which went nowhere, a short distance before the intended turn. Retribution was exacted, courtesy of a time point just around the corner. Jokers which had been recovered earlier in the morning were pressed into action. Jonathan Procter and Joel Chadwick interpreted the test diagram in Ballyboe innovatively and undertook a rather more extravagant circumnavigation of the yard than had been intended, which saw them end up in a cul-de-sac. Leading at the end of the day were Nick Ward and Clifford Auld. They can’t have been too traumatised by the fraternal encounter. I omitted to report yesterday that the weighbridge challenge at Ballyboe had generated some interesting estimates. Michael Cotter and Philip O’Reilly’s gross weight guess was only 10 kg off. John Abel and Frank Hussey were not as perspicacious. Indeed, they were so wide of the mark that the only plausible explanation is that they reckoned Frank weighs about 500 kg. The sun decided to make its presence felt today which everybody, apart maybe from hatless, tonsorially challenged folk, enjoyed. Andy Lane and Ted Gaffney were able to display their resplendently white jump suits to best effect. Andy reported that Ted was pretty hopeless in the morning, and not much better in the afternoon! Only a few missed the slot into our time point in the picturesquely dappled Castlemorris woodland. After lunch in the well organised Anthony’s of Piltown, our next time point was at a double triangled junction which endeavoured to tempt the less vigilant into a wrong (and early) approach. Only four crews didn’t follow the intended route so whether this counts as the chicanery being successful or not, I am not sure. I am informed that the most hospitable regularity team is Richard & Jo McAllister who have a cosy table (with vase of flowers) and chairs set up. They even give out sweets to the competitors. Others were not so congenial. Apparently the pair at the finish of the Kiltorcan Test asked for the code which caused some alarm until they revealed that there hadn’t actually been a Code Board. Andy Bailey didn’t endear himself to Philippa by attempting to start the final test of the day with the handbrake “on”. Eric Kavanagh reported that they kept getting stuck in reverse. To unstick it requires seat removal and confined grovelling. I enquired as to why they needed to engage reverse so frequently. John, very loyally, revealed that Eric had made some inopportune navigational choices. When approached as to how her day had been, Jayne Wignall enigmatically responded with: “one can always do better”. 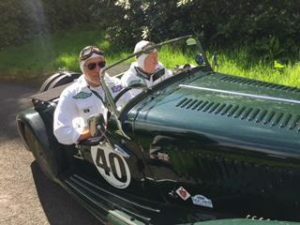 Paul Carter caused Peter Banham some chagrin when his Bentley’s engine started misbehaving. Paul’s scattergun approach to ameliorating the issue was not as methodical as Peter would have thought appropriate. Nonetheless, whatever they did, power was restored – albeit two minutes after Paul was due to leave the control. Peter Rushforth had a traumatic time after lunch when his hat went AWOL shortly before they were due to depart. It eventually turned up under his scarf, but in the meantime he was placated to some degree by the selfless David Cook sacrificing his cap. Of more concern was the Halda whose gears were awaiting reinstallation in an effort to rationalise the variable distance conundrum. The post lunch test proved particularly exacting for Peter Little and Louise Cartledge when Louise began with the Tulip instructions for the next regularity. Always up for a challenge, that girl! Marshal, Jeremy Odlum had difficulty pinpointing one of his time points. The wall on which the pink dot had been sprayed had been demolished and was being rebuilt by the man of the house behind the wall. Strangely though, the marking on the road was also missing. When chatting to the man, Jeremy discovered that he had power washed it away. He had surmised that the marking was the work of opportunist thieves who were signalling his house to be worthy of attention. A tractor and trailer on Reg 3/3 cost Irvine Laidlaw and Tony Davies over a minute. It did manoeuvre to let them past, but it was quite a protracted operation involving reversing. John Abel and Frank Hussey were also delayed. Anthony Galliers-Pratt has known Charles Young since they were seven years old. They were in prep school together and have been friends ever since. Anthony revealed that Charles had gone on to Gordonstoun where he acquired O-levels in sailing and fire-brigading. His aptitude for navigating is summed up by his response to Anthony’s request for guidance on their first event together as they approached a T-junction – “straight on”. I did not afford Charles the opportunity to reply! The C-o-C was very pleased with himself when he was timed at the Kiltorcan test and was told it was very competitive time. There was a caveat. Fred Bent had demonstrated his navigational talents by interpreting the instruction so that Michael completed just one lap rather than the intended two. You may have noticed that I haven’t made much reference to competitors’ fortunes vis-à-vis the leaderboard. Taking part and enjoying whatever comes one’s way is the approach I prefer. Winning is nice but not the be-all and end-all. John Abel and Frank Hussey are currently ‘top of the heap’. And so the odyssey careened to a conclusion. I use ‘careened’ for its alliterative contribution. I would like to think everything was under more control than its meaning might suggest. The event finished with two regularities, the first notable for its snack-stop halfway through at Osborne’s in the middle of nowhere, and the second its difficult to pronounce name, Skeaghvasteen. In what is not unusual with Irish names, there are several pronunciations and, indeed, spelling variations of this metropolis. There were five regularities which most coped with satisfactorily. The last day reverse seeding is quite attractive from a marshalling perspective as you know that when the end is nigh, visitors will arrive more punctually and more regularly. Features of the day’s regularities were random tractors, combine harvesters and sundry other farm machinery which added to the excitement. The final control in Kilkenny Castle provided an opportunity to see the cars at their best in glorious sunshine. There was some shuffling at the top of the leaderboard. Clifford Auld missed a slot left early on while looking down at the wrong time. Needless to say, there was a time point just into the slot, so his and Nick’s recovery exercise was severely punished. This slip elevated John Abel and Frank Hussey into a lead they never relinquished. Irvine Laidlaw and Tony Davies were second and David Cook and Peter Rushforth completed the top three. Then it was back to the Lyrath for pre-prandrial ablutions. The Prize Giving Dinner was responsible for probably the biggest time penalty of the event. The start was very close to going OTL. The formalities were seamlessly interwoven with the culinary imperatives. Ian McCulloch masterfully manipulated an array of mellifluous orators (sorry, ran out of alliteration!) – Mickey Gabbett, Michael Jackson, Shane Houlihan, Bernadette Wyer (IVVCC) and Rosie Temple (Magee). The awards were presented by the last, and Zusanna Houlihan and Mary Jackson. Michael Kunz and Carolyn Ward won the Against All Odds Trophy, Philippa Spiller and Andrew Bailey the Spirit of the Rally Award. Philippa also won the Best Navigation of Regularities, and John Abel the Best Driver on Tests. The Marque Team Prize was won by the Bentley Bunch – Bill Cleyndert & Jacqui Norman, Peter Little & Louise Cartledge and Andrew Bailey & Philippa Spiller. The Club Team Prize was won by the STD Register faction of Nicholas Ward & Clifford Auld, David Cook & Peter Rushforth and Jayne Wignall & Kevin Savage. A perusal of the results will apprise you of the Class Placings. The evening was brought to a close with a few words from the winner, John Abel, who offered some very kind sentiments about everything and everybody involved with the event. Dont forgot you can check out the IRG Instagram page to view a gallery of photos and videos taken throughout Shamrock 2018.